Neoclassical economics covers several distinct schools of thought, including traditional neoclassical economics, supply side economics, and new classical economics. Each of these schools of thought shares a number of key beliefs, which makes them neoclassical. The first belief is that the macro economy is self-correcting, or that there is no need for government intervention. The second belief, for reasons to be discussed shortly, is that government “fine tuning” of the economy either through fiscal or monetary policy would be unwise and ineffective. In general, neoclassical economists favor low taxes to stimulate aggregate supply and economic growth. They also favor limited government spending–they believe in spending on national defense, but not much for transfer policies like Social Security, Medicare, Medicaid or other types of welfare spending. Neoclassicals also favor a more passive monetary policy than Keynesians. President Reagan advocated tax cuts in 1981 on the basis of their supply-side effects. Coupled with increased defense spending in the early 1980s, fiscal policy under Mr. Reagan clearly stimulated aggregate demand by increasing both consumption and investment. Falling inflation and accelerated growth were signs that supply-side factors may also have been at work during that period. President George W. Bush’s chief economic adviser, N. Gregory Mankiw, argued that the Bush tax cuts would encourage economic growth, a supply-side argument. Mr. Bush’s next chief economic adviser, Ben Bernanke, who became the next chairman of the Federal Reserve Board in 2006, made a similar argument and urged that the Bush tax cuts be made permanent. Figure 1. Famous Economist. 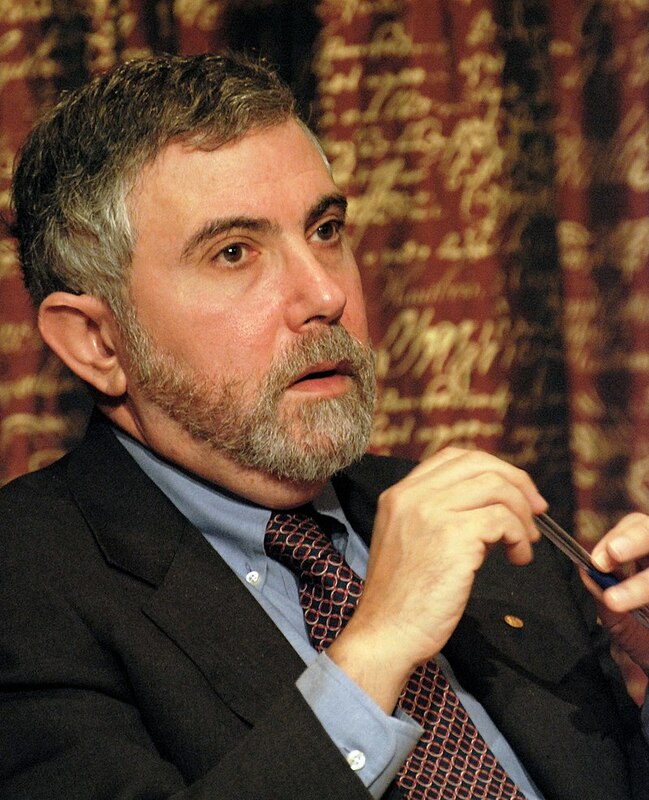 Paul Krugman, one of the most prominent Keynesian economists of the 21st Century. Keynesians believe, based on the experience of the Great Depression of the 1930s and more recently, the Great Recession of 2007-2009, that the economy can be in equilibrium at a level of GDP that does not correspond to potential, so that a GDP gap exists. This means that the economy will not be at full employment. Such an equilibrium can correspond to either a recession or an inflationary boom. In addition, even if the economy is self-correcting, the process can be so slow that the GDP will not close, and employment will not be full for an extended period of time. Because of this belief that either the economy is not self-correcting, or that the correction may take a long period of time, Keynesians also believe that government has a responsibility to manage the economy. They encourage stimulating the economy during recessionary times and slowing the economy down during booms, using a combination of fiscal and monetary policy. Let’s consider how this might work in the real world. One criticism of early Keynesians was that they didn’t believe monetary policy was very useful. The reality is more nuanced. Keynes was the preeminent monetary economist of his generation. Indeed, before he wrote The General Theory, his magnum opus on macroeconomics, he wrote a two volume Treatise on Money. To say that he didn’t understand or believe monetary policy could be effective was simply not true. That said, he did identify a situation when expansionary monetary policy wouldn’t work. We’ll look at this “liquidity trap” shortly. More generally, Keynesians believe that monetary policy is an effective tool for managing the macro economy, through open market operations. John Maynard Keynes, in his book The General Theory, defined the concept of the liquidity trap. The liquidity trap refers to a situation where people are willing to hold an infinite amount of cash, because interest rates are so low that there is almost no opportunity cost of doing so–the reward for putting your money in an interest earning asset is essentially zero. In such a situation, expansionary monetary policy is powerless to move the economy forward. The reason why is that monetary policy works by lowering interest rates to increase borrowing and investment and consumption spending. This would stimulate aggregate demand and increase GDP and employment. But suppose the Fed conducts an open market purchase, but the sellers simply hold onto the money instead of depositing it in a bank account. Then interest rates don’t fall and the process is short circuited. Keynes argued that in such a situation, the appropriate policy response was expansionary fiscal policy. For some 70 years after publication of The General Theory, most economists viewed the Liquidity Trap as an interesting theoretical idea, but one that never happened in the real world. Then came the Global Financial Crisis and the Great Recession when interest rates fell to zero and monetary policy seemed ineffective. During the Great Recession, the Fed reduced short term interest rates to near zero, with little effect on aggregate demand. In such a situation, traditional open market operations seemed unable to move the economy forward. Indeed, once it became clear that the recession would be very deep, the U.S. Congress passed the American Recovery and Reinvestment Act of 2009. ARRA was a bipartisan agreement to stimulate the economy through fiscal stimulus amounting to some $800 billion, some one third in tax cuts and two thirds in government spending increases on healthcare, infrastructure, education and other areas. Most macroeconomists agree that the fiscal stimulus hastened the end of the recession; some argue that the the stimulus should have been even larger. Another one of the key claims of Keynes was the existence of an “expenditure multiplier.” Remember from previous readings that Keynes said that aggregate demand was highly volatile, that even if the economy started at a level of GDP where it equaled its potential so that the economy was at full employment, AD could shift abruptly causing a recessionary or inflationary gap. In the Keynesian model, not only did changes in spending cause GDP to change, but the change in GDP was more than proportionate than the initial change in autonomous spending. In other words, aggregate demand is powerful since a change in spending results in a multiplied change in GDP. This spending multiplier was part of the reasoning behind the Keynesian view that fiscal policy is a powerful tool for managing the economy. While estimates of the size of fiscal multipliers vary, with spending multipliers typically greater than tax multipliers, the Council of Economic Advisors under the Obama Administration estimated a multiplier for the ARRA of about 1.5.